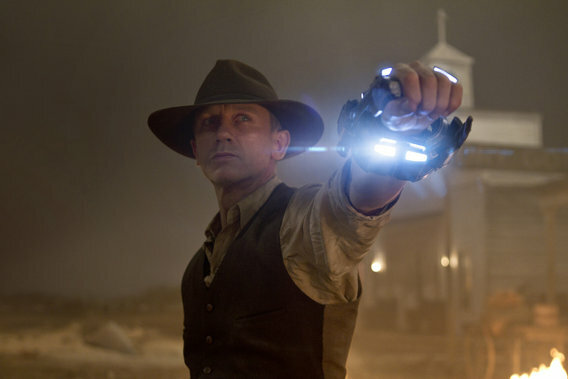 Just got back from an early screening of Cowboys and Aliens about a half hour ago. The recollections are fresh! You know the story. Man with no name comes to town. He stirs up trouble. Aliens attack. Been done, right? Actually, no. What’s amazing to me is that no one ever really thought to do this before. Why do aliens always attack us in the modern day? Stargate was the first movie I can recall that dealt with an earlier alien invasion. I put aliens in the Dr. Rocket/Captain Spectacular origin 2500 years in the past. I know Dr. Who has gone there. But there’s not many example of aliens not knocking down Will Smith’s door. It’s a legit conceit though, isn’t it? That aliens could come at any time? My wife laughed the first time she saw the trailer for Cowboys and Aliens. She still maintains it’s the stupidest idea for a movie ever. But it’s not, is it? It’s no more ridiculous than Tom Cruise running away from the Tripods. Gotta say, I had a good time with this one. Jon Favreau, the director, has never really done wrong (from what I’ve seen). He infuses an energy and a sense of humor that I quite like and that gels with my own sensibilities quite well. Cowboys and Aliens has that energy in spades. But what I think I like most about the movie is how very seriously it is a western first. The aliens just happen to be there. I love that. That’s new. Sometimes you take two things that have been done to death and combine them and you get something different. That’s what this is. Love Harrison Ford as the grizzled Civil War vet. Love Daniel Craig as the man with no name. Olivia Wilde was failed by the script, but she acquits herself well with what she’s given. One of my big complaints against the movie, it’s her character. There was a lot more that could have easily been done to make her more compelling and the movie just doesn’t go there. Also, the movie has the wrong ending. Won’t spoil it here, but you’re better off closing your eyes the last five minutes. There was more that could have been done there. Have fun this weekend, kids. This isn’t going to change your life, but this is a good genre mashup. I hope they do another. Cowboys and Aliens was actually a remake. Can you imagine? ?